Having an interesting destination can influence event attendees to try to stretch their budget to make the trip a reality. One great thing about Buffalo? Our city offers a full slate of unique activities, and we’re able to offer all these activities while still being reasonably priced (no $7 bottles of Topo Chico here!). If you’re the one planning the event, you’ll want to find ways to make the planning easy on yourself. We’ve put together a list of some of the best reasons Buffalo is the perfect place for your gathering. These suggestions aren’t just for conferences either; many of the meeting places around Buffalo are perfect for business mixers, team building events, engagement parties, trade shows, and weddings. What makes Buffalo an optimal destination for events? Buffalo’s renaissance has led to an expansion of its culinary horizons. The city is known for its eponymous wings, sponge candy, and beef on weck. However, it’s also home to many up-and-coming breweries and to restaurants that continue to push the envelope on innovative and flavorful dishes. Some of the restaurants double as event venues as well. For example, Riserva at Osteria is connected with Osteria 166, a restaurant that consistently leads the pack when it comes to local Italian cuisine. The banquet hall is just around the corner from the convention center, which makes it the perfect spot for a wraparound event or pre-conference happy hour. And, with space for up to 130 guests, the hall is large enough to host an event in its own right as well. 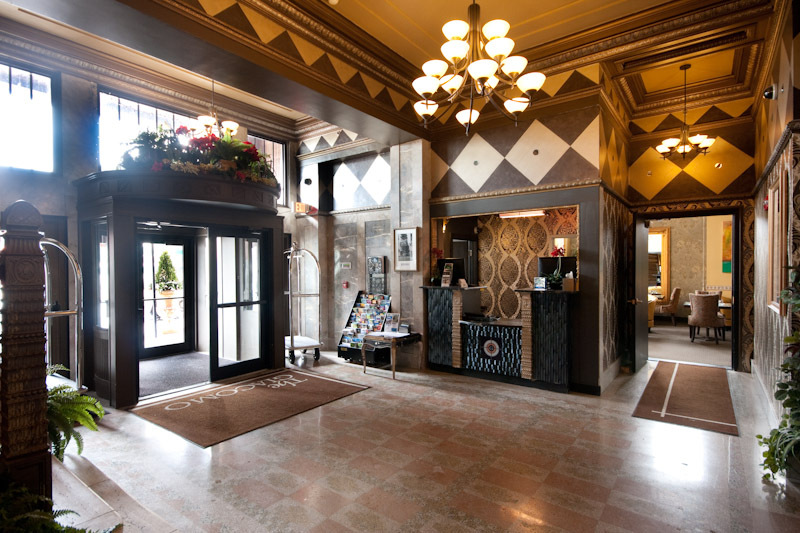 Having a great place to stay is important when you’re planning to attend an event, and there are plenty of hotels in Buffalo with easy access to things visitors love. Event guests want to ensure they’ll have a clean and comfortable room with easy access to the locations on their agendas. Many times, guests at more intimate or exclusive events enjoy the opportunity to network on-site without the added stress of driving in an unknown city, so a hotel with a relaxed gathering space can be a great fit as well. If you have a smaller and more intimate event scheduled, the Giacomo Hotel can offer a fantastic space. Perfect for hosting small team events and leadership gatherings, the Giacomo offers space to host a team of about 20 executives for a retreat, 35 people for a seated dinner, or 50 people for a mixer or reception. And, with the hotel’s Giacomo Lounge, you can ensure your guests have plenty of opportunities to socialize freely with their fellow event guests without having to leave the premises. Buffalo is lucky to have one of the world’s most magnificent pieces of natural scenery right in its backyard. A tourist destination like Niagara Falls is always a draw for events because it gives people a chance to experience something beautiful and unique, all the while combining business and pleasure. The Giacomo Hotel has a pristine view of the falls, another reason it can be an excellent fit for your event planning needs. The man-made scenery around Buffalo isn’t too shabby, either. The city’s long-standing love affair with architecture is apparent in its many revitalized buildings. Ellicott Square Building, once the largest office building in America, still retains a sense of 19th-century grandeur that can be easily incorporated into your event. And, for those looking for a more casual gathering that still boasts amazing views, Lucia’s at Dos Amigos offers a gorgeous outdoor space with a waterfront view perfect for hosting a mixer, networking event or anniversary celebration. When you’re visiting a city for an event, being able to move around quickly and easily makes the entire experience more pleasant. Buffalo Niagara International Airport offers more than 100 nonstop flights per day to over 30 locations; the airport is just about 15 minutes from downtown, too, which makes transport easy on your travel days. The city also offers a light-rail service, as well as a plentiful cab, town car, and ride-sharing options. After the party (or the conference, or the training event, whatever the case may be), there’s usually an after-party, right? Whether you have something official planned or whether your event attendees just want the freedom to walk around and explore, giving them access to areas with multiple options allows them to choose their own adventure and really embrace the experience. As an example, Elmwood Village is one of Buffalo’s most fun and trendy areas. If you’re planning an event In this neighborhood, booking The Orange Room at JT’s gives you the best of both worlds. You get a space for up to 70 people to mix and mingle; your guests enjoy the fantastic urban Italian cuisine; and, afterward, they’re free to wander and delight in Elmwood Village’s more than 300 coffee shops, retailers, art galleries and more. On top of all those great reasons, we have one more point to make in Buffalo’s favor. We’re not called the City of Good Neighbors for nothing. Hosting an event in Buffalo is easy and pleasant because the people of Buffalo go out of the way to make everyone feel at home, and to make each portion of your event a success.